Justice has finally been afforded New Zealand’s Mark Brown who set a new course record on his way to qualifying for this year’s Open Championship at Muirfield. Brown went into the second and last day of the International Qualifier five shots behind the leaders and recorded a blistering 10-under par 62 to lower the existing Kingston Heath course record by a shot. And after being denied the chance to contest , the 2008 Open Championship at Royal Birkdale Brown will now tee up in golf’s oldest major for only a second time since making his debut in 2009. In 2008, Brown was first reserve that meant arriving at the England course near 5.30am and then to the last official tee time at 4.20pm but with no withdrawals. There was an injury cloud over eventual champion, Padraig Harrington of Ireland but it was another former champion in Sandy Lyle who generated enormous controversy when he withdrew after just a handful of holes and thus denying Brown a place in the field. However the affable New Zealander has long put that behind him and now has tee time later this year at Muirfield. “Yesterday I was a fair way back, so today I wasn’t really thinking about it too much – I just went out and tried to enjoy it.” said Brown. “But it’s massive. I love this place and I played well here in November,” added Brown who finished tied third at the Australian Masters here last year. 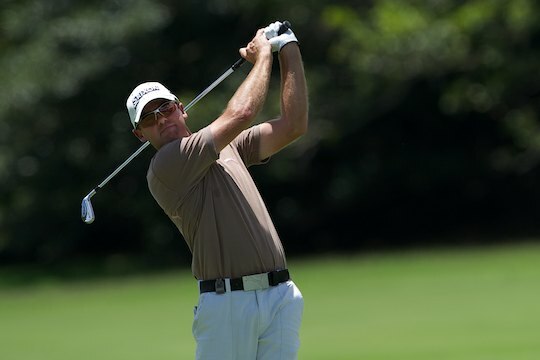 Brown is proud to become New Zealand’s first representative into the 2013 Open Championship but hopes a strong contingent of Kiwis will join him. “If there’s one major you want to play for me, this would be it,” added Brown whose best performance in a Major was 24th at the 2008 US Open Championship. This will be Brown’s second Open Championship – thanks to his Order of Merit finish on the PGA Tour of Australasia he qualified for the 2009 Open Championship at Turnberry where he missed the cut. Also qualifying into the world oldest golf championship via International Final Qualifying Australasia were Steven Jeffress on 9-under 63 and Stephen Dartnall on 8-under 64. It’s still yet to sink in for Jeffress that at 37 years of age he will tee it up in his first Major championship thanks to a composed round. “It’s pretty impressive – it probably hasn’t even sunk in yet, it’s going to be great, it’s going to be unbelievable,” said Jeffress immediately following his round. Also headed towards his first Major championship is West Australian Stephen Dartnall thanks to two solid performances at Kingston Heath. “I started off a bit scratchy actually – I was 1-over after six then made a few birdies and just played solid from there on in. It wasn’t quite as good as yesterday but it was enough, I guess,” said Dartnall. Current Australian Amateur champion, Cameron Smith, missed qualifying by one stroke following a final round 70. The 42nd Open Championship will be played at Muirfield from the 14-21 July 2013.